"After much deliberations on the Nominations&categories, we proudly Announce to you Successful Students, Who made The First student nominees Successfully selected out of many who Were nominated from different tertiary institutions in Nigeria. Final&Voting list of nominees coming out soon next month & voting will commence immediately . All Student nominees are here advised to text their names,institutions,phone number & categories as it appears here to our whatsapp contact@09068069931.Congratulations:KINDLY NOTE THAT ONLY THOSE WHOSECONFIRM THEIR ATTENDANCE WILL MAKE THE VOTING LIST." 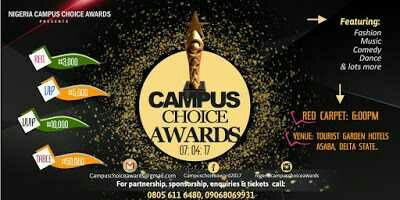 It was also observed that some of our eagles and falcons where among the nominations, to be announced as the next campus celebrities for 2017. Known as anambra state university to support our students who are among the nomination to give the school a better image out their in the world. Click the link below to check the nomination list and show C.O.O.U some love.